Sometimes I write books. Sometimes I don't. I remember books. Not reading them, of course, but owning them. I used to have stacks of jagged-edged first editions and dog-eared paperbacks covering my coffee table and overloading every bookshelf in the house. It was a rather impressive collection that undoubtedly made me appear to be quite the intellectual. 1) If you don’t need it, throw it away. 2) If it does not bring you joy, toss it. I loved my discombobulated library, but these two infallible rules made me realize that there was not one book, on its own merits, that brought me particular joy. So, the books had to go. All of them. Today, a sleek e-reader is the only item that sits on the side table in my living room. There is no longer any evidence of the depth and breadth of the vast literary interests I always fancied myself having. I used to have piles of magazines, too. These days, I allow myself only one magazine at a time. That means no subscriptions. I will only purchase a new edition after discarding the previous one. Consequently, before I invite anyone into my home, I spend hours at the newsstand selecting the perfect periodical which I set on the coffee table next to a jasmine or mahogany-driftwood scented candle. Typically, I select the New Yorker to subtly let my visitors know that I might possibly be the type of person who attends poetry slams. Every now and then, however, I’ll choose Goop Magazine if I believe my guests would be intrigued by my budding interest in DIY medical care. I also remember sweaters. Before I magically transformed my life by purging its excesses, my dresser was loaded with sweaters I hadn’t worn for years. That rumpled muddle of bleached-out cardigans and over-stretched pullovers once carried memories of romantic fireside snuggles and late night cram sessions in my frigid dorm room. But I have come to understand that an armoire full of ripped collars and soy sauce stained sleeves may have signified a rich past but barred me from living fully in the present or looking ahead to my future. Now my drawers are pristine. I own only two sweaters. I wear neither. They remain neatly folded, perfectly centered, one sweater per drawer. I will never be able to replicate their flawless placement, so I leave these two garments untouched. On one too many occasion, my husband remarked that I had taken this minimalism thing too far. So I got rid of him. I miss my husband from time to time, but overall, it is nice to have his side of the medicine cabinet empty and his hulking shoes out of the foyer. Along with my sweaters, I chucked my goose down parka. I prefer for there to be a one inch space between each hanger in the front hall closet. That puffy coat was so bulky it spoiled the ideal hanger configuration and therefore had to be cast-off. I used to bundle myself in that warm coat and take long meandering walks through the park. But the joy of an orderly life far outweighs the pleasure of fresh air and exercise on a crisp winter afternoon. These days, I almost never look wistfully out the window after a storm when the skies are cobalt blue nor do I long to run outside to be the first person to leave footprints in the freshly fallen snow. One upshot of rarely leaving my home between the months of November and March is that I have plenty of time to prepare gourmet meals. I love spending time in my de-cluttered kitchen. I have never felt better than when I ridded the cabinets of every chipped dish and mismatched mug. It was exhilarating to let go of the never used pizza stone and the over-priced blender that failed to live up to its promise of producing mouthwatering ice creams and rich velvety soups. I felt an indescribable sense of euphoria when I cleared the place of every unessential pot, pan and cooking utensil. All that remains in the kitchen is one cast iron skillet and a spatula. And cooking has never been so easy! Now, my diet consists exclusively of pancakes. At this point, I have gotten so skilled at flipping the pancakes by simply holding the pan and flicking my wrist that I am seriously considering ditching the spatula. At first, my children were thrilled to eat pancakes for breakfast, lunch, and dinner every day. But soon they began to mention that they might like something else to eat.Â When I finally realized that their constant grumbling about our streamlined meal plan brought me no joy whatsoever, I had no choice but to pack their belongings and send them out to the garage with their father. My kids are great and sometimes I do miss their laughter and little butterfly kisses. But to walk past their bedrooms every day and see the beds perfectly made and every toy neatly housed in its designated toy box fills me with a sense of calm that I have never experienced before. It is astounding to me that the humble act of getting organized has had such a dramatic impact on my life. By adhering to those two beautiful rules, I have magically transformed my home into a serene and relaxing oasis. What a relief it is to know that the rest of my days will be filled with peace, tranquility, and pancakes. This article originally appeared in OTV Magazine. Click here to see it there. So, last month I contributed an article to the Encouraging Dads Project. This month, it’s Hooray for Moms! Enjoy! Here’s a ridiculous article I wrote a few months back and forgot to upload here. Oops. Enjoy! I read an article the other day. No, I listened to an interview on the radio the other day. It was about a new study being done to understand why a certain sect of monks in Thailand, or maybe it was Taiwan—I don’t think it was Tibet—are suffering from obesity at an alarming rate. I could Google the place they are from, but so could you if you really want to fully understand the plight of the aforementioned fat monks. This particular essay will in no way provide any useful understanding of the topic. This essayist is not so interested in the how’s and why’s of the pitiable state of those poor suffering monks. Though, from what I gathered, despite the fact they are eating a controlled diet, fasting often, and meditating all of the time, these particular monks are obese. To be honest, I couldn’t hear the whole interview because my kids were in the car with me and were arguing about whose turn it was to kick the back of my chair. Maybe those super smug hot yoga junkies aren’t the pinnacle of health and fitness they seem to be as they ring out their sweat-soaked towels. Apparently it is a low protein diet coupled with a ridiculously sedentary lifestyle that leads to their tragic weight problems. There may be other contributing factors, but my children staged an all-out whining mutiny imploring me to change the station when the lady on the radio began to describe the diabetes and subsequent leg amputations that are often associated with Fat Monk Syndrome. The condition is not actually called Fat Monk Syndrome. At least it wasn’t called Fat Monk Syndrome, or FMS for short, but after this article hits the mainstream media, I have no doubt that the use of the term FMS will become as ubiquitous as PTSD and LMFAO. I’m not sure how much time and resources have heretofore been dedicated to the FMS issue or how long the study is to go on. But the point is, there are fat monks out there. Fat Monks! Unhealthy fat monks! These are the folks in our world that are supposed to have it all figured out. They have devoted their lives to a higher power. They spend their time doing the things we are all supposed to do: they meditate, they contemplate, they practice extreme self-awareness all while breathing deeply into their navels. These poor individuals have not spent their lives docked in front of flat screen televisions plying themselves with football and nacho cheese sauce. These humble humans have not Supersized themselves at the drive through. No. The fat monks of Timbuktu have spent their lives dedicated to something larger than themselves (and clearly that something must be really, really large to keep ahead of those monks). How then is it possible that there is an entire population of monks that are extremely obese and extremely ill? The moment I became aware of FMS changed my life. Just before I yelled back to my kids, “Can’t we ever listen to something that I want to hear on the radio for minute? I’m the one spending hours a week chauffeuring you to birthday parties and oboe lessons all week! Is it too much to ask that I get to finish hearing this story?” I had an epiphany. Unfortunately, while I was yelling, I missed the explanation as to what is being done to ameliorate the devastating impact of FMS. But luckily, my epiphany was about me, not the monks per se. So for the purpose of my thesis, I had all of the information I needed for a massive revelation—an enormous, if not altogether fully informed “ah ha” moment: all of a sudden, those monks represented every enviable lifestyle that I, for my entire adult life, could only dream about and deride myself for being too weak and too unfocused to ever embrace. And it was at that moment, for the first time in decades, that I learned that I may have been right all along to avoid such aspirations. 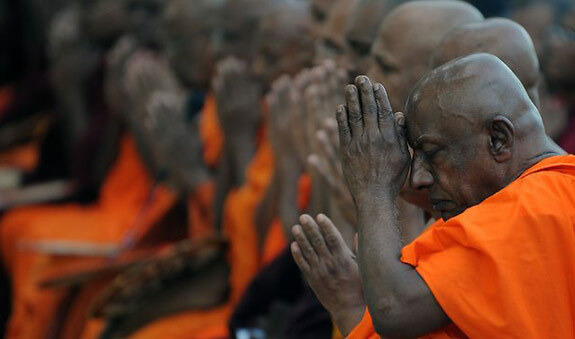 If these holy monks were victims of FMS, maybe they weren’t the only ones. Maybe FMS is a worldwide epidemic afflicting all extreme lifestyle practitioners! Maybe those super smug hot yoga junkies aren’t the pinnacle of health and fitness they seem to be as they ring out their sweat-soaked towels in slippery locker rooms across the globe; maybe they too are unhealthy and silently suffering from FMS. And maybe all of those marathon runners, with their ice packs and knee braces, should be pitied, not envied. What about the raw vegans and the PTA presidents? How about those people who manage to save all of their receipts for tax purposes or those who get up and make their beds every single day or remember to get their dogs vaccinated every year? These extreme humans used to represent for me the unattainable. I used to read about them in magazines that I’d skim through at the checkout line at Walmart. I used to hate those people. And I would have gone on hating them had I not been made aware of the underreported epidemic of severely overweight religious devotees across some swath of Asia or Africa. Now, I just feel bad for them all. I am almost tempted to start an FMS awareness campaign, but that sounds like an awful lot of work.